Today kicks off Mental Health Awareness Month, a time to shine a light on mental illness by talking openly about it, so people who struggle with it are inspired to get the help they need. One in five adults in the U.S. experiences mental illness each year, and that statistic holds for children: about 20 percent of children either have or or at some point have had a debilitating mental disorder, according to the National Institute of Mental Health. Half of all chronic mental illness begins by age 14 and 75 percent by age 24. During this year’s Mental Health Awareness Month, all of us can help peel away the stigma by learning the signs of risky behaviors, including drug use, excessive spending, and obsessive internet use, that people engage in to cover up symptoms symptoms of mental illness. 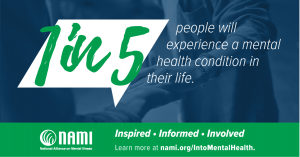 Half of adults in the U.S. who experienced a substance abuse disorder have a co-occurring mental illness, according to the National Alliance on Mental Illness. Mental Health America, which started Mental Health Awareness Month in 1949, offers mental health screening at http://www.mentalhealthamerica.net/mental-health-screening-tools. “The sooner mental illness is identified and treated, the better the outcome. People with mental illness are able to enjoy fulfilling, productive lives when they have effective treatments available to them,” Parker said. If you or someone you know needs help, contact NewBridge Services at services@newbridge.org or 973-316-9333. Visit newbrige.org for more information.